For optimum selection of characteristics of CMP type canned motor pumps taking into account specific conditions of their operation (flow, pressure, temperature, density and viscosity of pumped liquid, material of flow part, etc.) 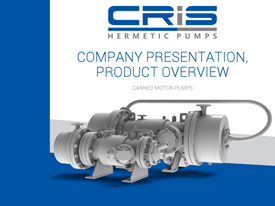 ‘CRIS Hermetic Pumps’ recommends the Customer to fill in the questionnaire and submit it for consideration. Explosion protection in accordance with 1ExdsIIBT (1-4) X, 1ExdsIICT (1-4) X. 221 - serial registration number. Non-abrasive impurities of a size of up to 0.2 mm and up to 0.2% in terms of weight are admitted in the pumped liquid. K, E - stainless steel 1.4571 (sleeves of stator and rotor, impellers, bearing housings), stainless steels 1.4878, GX10CrNi18-8 (the remaining elements of the flowing part).